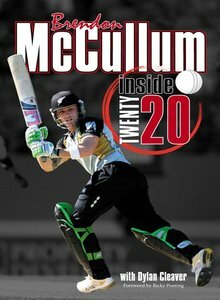 Review by Mark Pirie of Brendon McCullum: Inside Twenty20 with Dylan Cleaver, Hodder Moa, 2010, RRP $29.99. Foreword by Ricky Ponting. During the 2002/03 season, I was playing a 2-day match for Hutt District 2Bs at Wainuiomata’s Richard Prowse Park. It ended early with us annihilated by an innings after a half hour on the second Saturday as 2-day club games sometimes can. The two teams then wondered what to do? Head for a shower at home, then back to the clubrooms later in the afternoon, or maybe start a new game, 20 overs each, with 10 players getting 2 overs to bowl each? We chose the latter option and started a fun hit-out inspired by Martin Crowe’s Cricket Max and playing effectively what is now termed ‘Twenty20’. That in mind, my initial thoughts on our friendly ‘Twenty20’ were positive but I guess I hadn’t seen it as anything more than a bit of fun, not to be taken too seriously. That’s why Brendon McCullum and Dylan Cleaver’s new book on the real Twenty20 phenomenon is a ground-breaking and timely release. It’s one of the first books to dig deep into Twenty20 at a national and international level. McCullum himself has been a trail-blazer making a world record 158 for Kolkata Knight Riders and has helped develop and improvise his shot techniques, most notably with the introduction of Tillakaratne Dilshan’s scoop shot. It’s a very rewarding book. Dylan Cleaver, Heath Mills, Black Caps players and other officials along with newspaper quotations from journalists interject throughout McCullum’s discussions with handy match facts, controversial quotes and important Twenty20 trivia, while Cleaver himself presents a history of the Twenty20 format in his introduction. Australian great Ricky Ponting also chips in with a foreword. Cleaver, a well-known sports journalist, has done cricket followers a favour here by treating the new phenomenon in cricket as something to be looked at more closely and with a degree of seriousness. For those who’ve dismissed Twenty20 as being too radical a departure from the purist’s game of Test cricket, it certainly is an eye opener on the new form of the game. Twenty20 has helped revitalize the sport, bringing new crowds into the world’s stadiums, offering financial wealth and security to the players and their families, and finding innovative ways of playing in terms of bowling, fielding and batting. Some of the highlights are McCullum talking about his world record knock of 158 off 73 balls for Kolkata against Bangalore in the IPL 2007 opener. McCullum notes that his form in the nets prior to the innings was abysmal. Even he hadn’t dreamed of coming out and playing the innings of a lifetime to kick start the money-rich IPL. The photos of McCullum in a gold helmet and gold batting pads are stunning. If IPL is all about entertainment, it certainly looks futuristic from a cosmetic point of view. The rest of the book covers various aspects of Twenty20. There is a handy chapter on McCullum’s shot techniques in Twenty 20: the Dilshan scoop, the slog sweep, the slap, the paddle, the Pietersen switch-hits are all discussed. As a kid in Junior cricket for Onslow I used to bat one over right-handed then the next over left-handed. The adult umpire eventually told me I could only bat one way; it was unfair for the bowlers, so I chose to bat right-handed. The irony is that Twenty20 makes batting both ways now possible. If I were a kid now, I’d love to play Twenty20 cricket. There’s an excellent series of photos showing how McCullum plays each shot. For players wanting to learn some of the techniques needed in Twenty20 it is indispensable information. Elsewhere McCullum discusses the World Twenty20 competitions, his two seasons at Kolkata Knight Riders, including his 2008 season as captain where he displaced Sourav Ganguly, the Prince of Kolkata, as leader of the team. There are chapters on ‘Club Vs Country’, McCullum being stripped of the Black Caps’ vice-captaincy, a chapter on Otago’s run to the Champions League and his ripple-stirring time with New South Wales as well as a chapter where McCullum selects his world Twenty20 XI. Guided by McCullum’s modest, honest and well-judged reflections on his strengths and weaknesses in the game, insights into how Twenty20 has altered the cricket world along with Cleaver’s reliable research and support material, this book is well worth having. I’d recommend it to all cricket fans interested in finding out more about the game's newest departure. Brendon McCullum: Inside Twenty20 is an essential read.